I went to visit Antonella (my sis) and Gus (my brother in law) on my last holidays to Aspen. This was not my first time in Aspen, I had been there for 8 days 2 years ago...but I have to say that even though I had already been there, the same things that amazed me back then, still amazed me now. I'll share this with you below! The first time I was there it was for a rather short time, I spent most of my time skiing during the day and going out at night, Anto didn't have a car so we were relying a lot on buses...and I was there visiting only my sister. This time, I didn't only have a sister but also a really cool brother in law ;-), plus some really nice American friends that I had met back in October during Anto and Gus' wedding in Peru. During their stay in Peru we had some really fun times in Lima, Mancora and Cuzco...so lets say that I knew I was going to have some fun in Aspen too! Aspen is a bubble in the US. At least that's how I view it. It's this very cute little town in Colorado where the rich and famous live...those and also young people who go there because of the great sports and life and because they can make good money by working there. 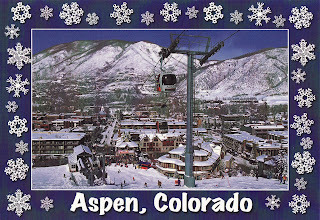 There are 4 montains to ski: Aspen, Highlands, Buttermilk and Snowmass. For American standards they are quite close to each other but for me, spoilt in Amsterdam, it seemed pretty far to go from Snowmass (where Anto lives) to Aspen...it's about a 25 minute drive! As you can imagine, this is a very secure town. Lets just say that we were out of the city for 4 days while we were to Vegas and Anto and Gus didn't lock their door. This meant that ANYBODY could have just opened the door and walk in...and of course nothing happened! This habit of leaving the door open is rather weird for me, as when friends come over they usually knock the door and immediately walk in. I have to say that one day I was waiting for a friend to pick me up and I needed to pee...I don't know how many of you actually close the door when you pee at home alone! Lets say that I was VERY glad I thought this before...because indeed the moment I sat on the toilet the door opened! The whole bus system is very well organised. During skiing time buses leave every 20 minutes and they go to any of the mountains totally free of charge. All the buses have special holders for the skis too. One of the things that I also find rather funny is the fact that EVERYBODY knows EVERYBODY. So every time I would walk around Snowmass or Aspen with Anto, Gus or some other people, they would say hi every 2 minutes to either people passing by or to: the waiter, bartender, the police officer, the bus driver, the fireman, the ski instructur, the disco bouncer, the sales person, etc. Even funnier....the friend who one day was the ski instructor would be the bartender the second day and the bouncer on a third ocassion! So as you can imagine everybody is really nice and friendly, everybody chit chats for a little while. Of course I don't want to imagine how are they with the gossip ;-)...I was not long enough to find that out...I guess you need to be a local for that! As all of you know, America is very customer service oriented...ok, anywhere much more than the Netherlands! However the attention from the waiters over here is unbelievable! And I guess it had to do by the fact that you are supposed to tip them 20%- can you believe this??????? Lets just say that being a waiter brings good money, and the service is so good that I was happy to pay it. During my whole stay the weather was really nice to me. Blue skies and beautiful sun....the snow melted around the town during the time I was there, of course there was still snow in the mountains! You'll see in other posts and photos that I was even wearing short sleeves in some occasions.